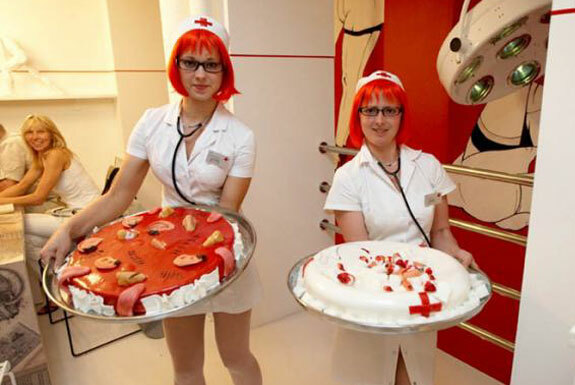 Most people do not associate hospitals with great food, fun or festivities. 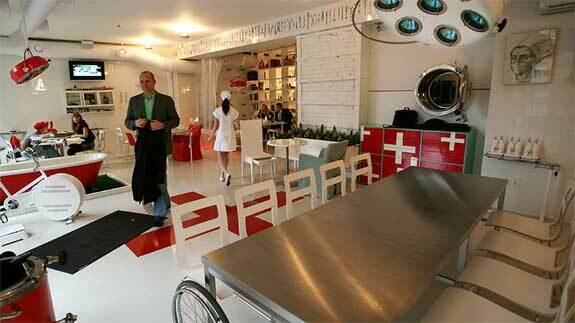 The owners of Hospitalis, an unusual restaurant in the Latvian capital of Riga, are hoping to change that. At Hospitalis patrons eat amongst skeletons, hospital gurneys and video screens playing medical clips from various popular movies. 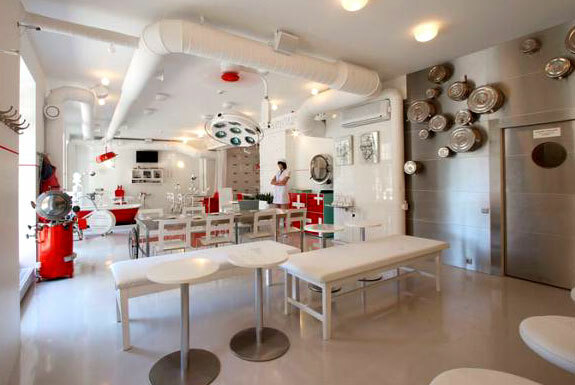 The two story restaurant is decorated mostly in an E.R. operating room theme. But if the thought of undergoing surgery isn’t unpleasant enough for you request a table in the restaurant’s faux dental office. There you can enjoy your meal while sitting in a dentist’s chair. (Fortunately, the dental dining area does not include round sinks of swirling water for patrons to spit their food into). The one medical-related place people might dread going to even more than a dentist’s would be a gynecologist’s office. So, of course, Hospitalis has one of these too. Ah, listening to a live band while eating a meal in a gynecologist’s exam room—now there’s a multi-orifice experience few other restaurants can match! 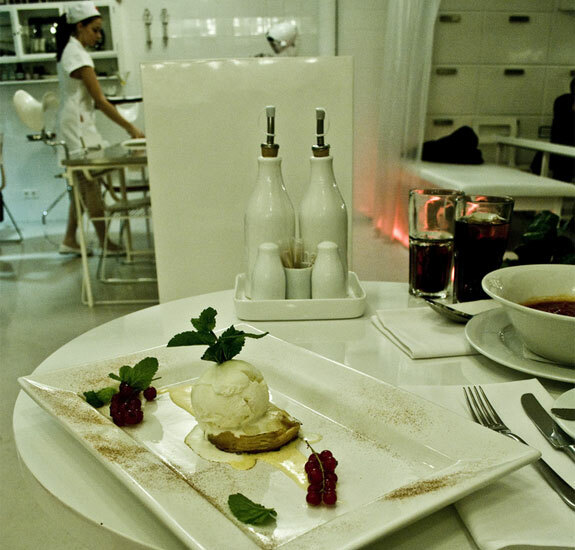 The food at Hospitalis consists mostly of continental European selections and salads. (We’ve heard of health food but this is ridiculous. Bada bing!) An entree with appetizer and drink will set you back around Ls. 15 (which is about €21 or US$27 or about US$24,973 less than it costs to visit a real hospital in America). Hospitalis also has a small “crazy menu” with entrees like liver-filled quail that are prepared in such a way as to resemble something that might have been surgically extracted from a person. You have to sign an indemnity waiver before ordering anything from the “crazy menu” (no, that’s not a joke) so here’s to hoping that the liver they fill the quail with isn’t being removed from you. 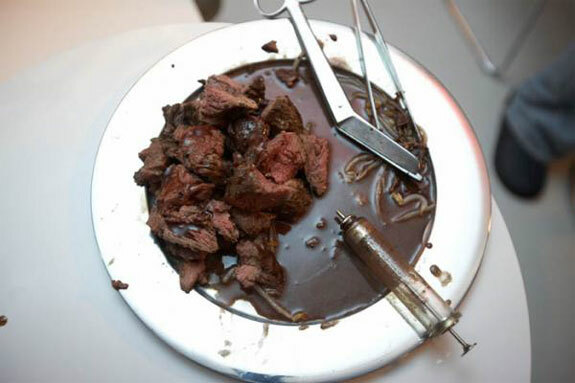 Though you can order a “normal” meal at Hospitalis be prepared to eat it with syringes, scalpels and other surgical utensils. 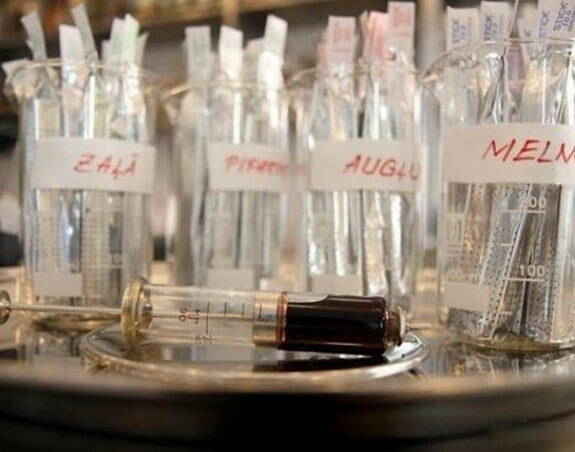 In that same vein (pun), drinks are served in the likes of test tube vials and I.V. bags. If you are the designated driver but can’t resist getting a drink then ordering a Corona beer in a urine sample jar should ensure that you’ll be sober for the trip home. Amazingly, Hospitalis is not the world’s only medical themed restaurant. We previously reviewed one in Taipei; there’s another in Singapore. All three were started by former doctors and all have some sort of naughty nurse thing happening (at Hospitalis some of the female wait staff wear rather skimpy nurse’s outfits), which makes us wonder where it is these doctors practiced before getting into the restaurant business. 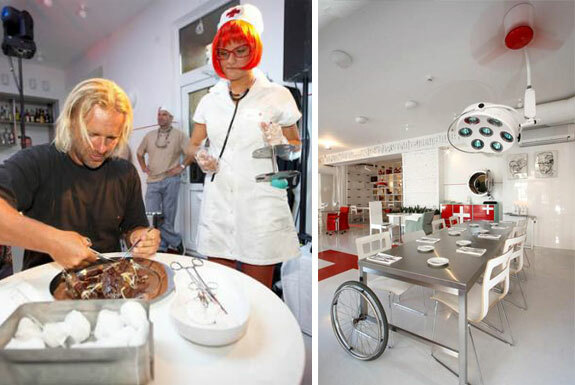 Hospitalis, however, is the world’s only medical-themed restaurant where diners can volunteer to be strapped into a straight jacket while being spoon fed by the restaurant’s staff. This makes sense to us—you’d have to be crazy to eat here. Actually ti’s shut down now (hopefully only temporarily, as concept is super great). Thanks, Riga Guide. If you think of it do drop us a comment when the Hospitalis re-opens.